I wanted to do a shopping finds article including all the lovely new pieces popping up here and there. 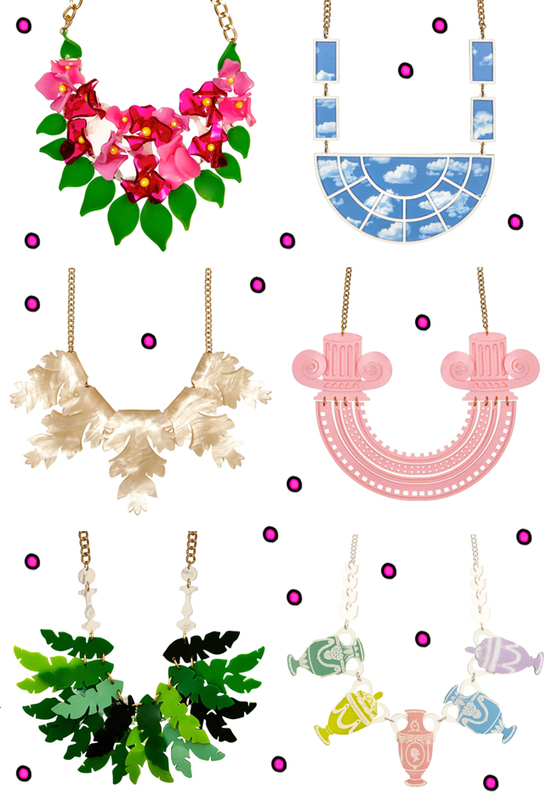 Cunning Tatty Devine changed my mind when I saw their great new collection. I just had to dedicate a post to their SS16 only. The new acrylic masterstroke is called, "Skies of Antiquity" and it is inspired by nature, Roman Architecture, the Renaissance and classic iconography. Tatty Devine takes you back in time to the era of The Grand Tour of Europe. Of course, there is no tour without souvenirs and this is where the jewellery comes in: All pieces are part of a numbered edition between 50 and 150 and come with an exclusive certificate of authenticity that makes those pieces ideal for collectors and magpies with a love for statement jewellery. Collecting Tatty is therefore far cooler than collecting little statues of famous buildings! What do you think of Skies of Antiquity and do you have any favourites? I'm a big Tatty Devine fan but this series just isn't grabbing my attention. I love their nature-inspired pieces, their name necklaces and I'd love one of those huge lobsters!